The full campaign is now complete. All six scenarios and the complete story are available for download. Author/Creator : Kristofer Bengtsson all credits goes to him. Many are the unimaginable terrors that tear at the fabric of our reality, relentlessly probing for a way to break through. The increasing occult activities around Arkham have not gone unnoticed, and with it the number of men who would be seduced to aid these terrors grow as well. What began with Dr. Henry Armitage’s undertaking in Dunwhich and the ensuing undertakings by his associates has turned the surrounding area into a beacon for the terrors from beyond to home in on. 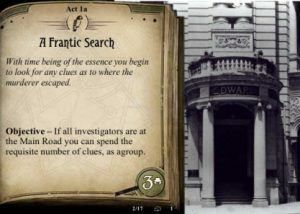 In The Approaching Storm your duty to help Dr. Armitage turns into a deadly game of hide and seek, as one of his colleagues is murdered in front of your very eyes. The first scenario has you chasing down the culprit through the less than savory parts of Arkham while the second sends you on a trip up the Miskatonic River in an attempt to connect the murder to the occult research which undoubtedly led to the demise of Dr. Armitage’s colleague. It isn’t long before you find yourself assailed by voices in your head, promising godly rewards if you only abandon your quest. Those of you who downloaded this as soon as it released (like in the first hour) are missing a page with two cards for the second scenario. Please redownload. I’m a member of a fan made scenario translation team, and we wish to have your permission to translate in french your approching storm campaign. We use strange eons so we’ll need your cards illustrations to make the translated cards. If you are OK please contact me at vinn.quest.15@gmail.com , thanks ! Firstly, thank you very much for this campaign. Enjoying it so far. Once completed, I will rate. I’m having a difficult time with the +4 on Act 4a. I know I’m likely overthinking or missing something but I can only total 6 Crew members in Victory display. Playing with 2 investigators, you would have 3 Crewmen, Capt. Whollerton, Mr. Wright, and Mr. Guilland for a total of 6 (need 7). Suggestions? Thanks again!